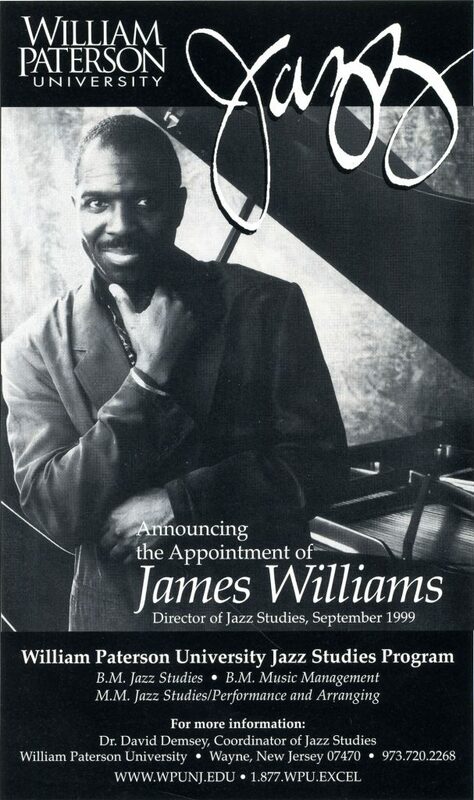 James Williams was an active pianist-composer on the international jazz scene for over 20 years. Although perhaps most well known for his association with Art Blakey and the Jazz Messengers, he led his groups, toured, performed and recorded with numerous legendary jazz musicians. He was Director of Jazz Studies at William Paterson University from 1999 until his premature death in July 2004. Born March 8, 1951 in Memphis, Tennessee, he grew up listening to such artists a Ray Charles, Booker T., Donny Hathaway, Marvin Gaye, Stevie Wonder, King Curtis and Ramsey Lewis. He began formal piano study at age 13, and was subsequently an organist at Eastern Star Baptist Church in Memphis for six years. He earned a B.S. in Music Education at Memphis State University, where he formed solid friendships with fellow Memphis pianists Mulgrew Miller and Donald Brown. A devotee of the Memphis piano giant Phineas Newborn, Jr., James delved into his hometown’s rich jazz heritage, associating with Harold Mabern, bassist Jamil Nasser and saxophonists George Coleman and Frank Strozier, among others. At 22, Williams moved to Boston to accept a teaching position at the Berklee College of Music. A year later, he joined drummer Alan Dawson’s group, supporting Art Farmer, Milt Jackson, Sonny Stitt, Pat Martino, Jean Carn, Red Norvo, and Arnett Cobb. 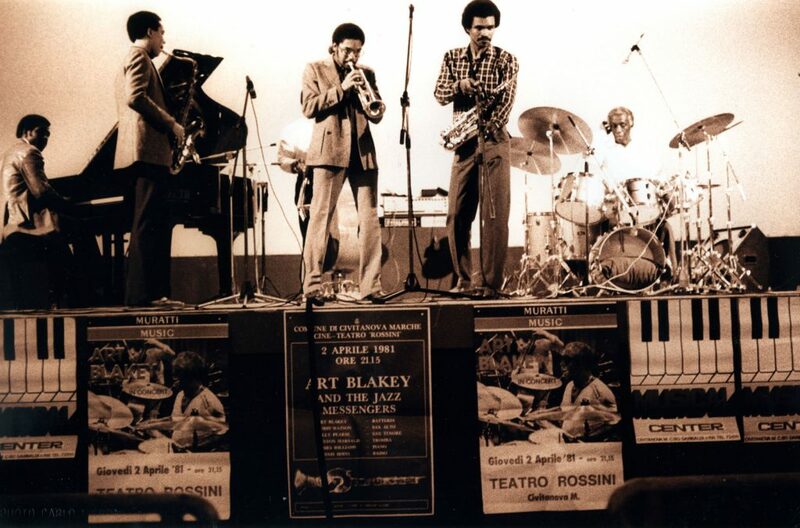 In 1977, Williams recorded his first album as a leader, played his first concert featuring his compositions – and first met Art Blakey. That encounter ultimately led to a four-year, 10-album tenure with the Jazz Messengers. He logged countless hours on the road with the Messengers as part of the now famous lineup that included Wynton Marsalis, Bobby Watson, Billy Pierce and Charles Fambrough. After leaving the Messengers in 1981, he returned to Boston, re-joining Alan Dawson and also playing with Thad Jones, Joe Henderson, Clark Terry, Chet Baker and Benny Carter. Moving to New York in 1984, Williams was in high demand as an accomplished accompanist and sideman, and played, toured and recorded with such prominent artists as Dizzy Gillespie, Ray Brown, George Duvivier, Art Farmer, Kenny Burrell, Elvin Jones, Billy Cobham, Freddie Hubbard and Tony Williams. After accepting the William Paterson position, he hired leading WP jazz students as members of his professional ensembles, giving them invaluable professional experience and exposure. As a leader, Williams worked in a broad range of formats. His own CDs comprise traditional piano-bass-drums trios; larger ensembles with several horns; jazz trio with the Boys Choir of Harlem and guest Diane Reeves; a unique four-piano format with rhythm section; a sextet with a front line featuring three master saxophonists; a classic traditional setting for veteran Clark Terry; a solo piano recital; and James’s most recent group, “Intensive Care Unit” — a jazz-gospel ensemble featuring two vocalists, saxophone and rhythm section. He was also a busy producer of albums for Phineas Newborn, Jr., Harold Mabern, Donald Brown, Billy Pierce, Bill Easley, Tony Reedus and Geoff Keezer as well as his own recordings. His company, Finas Sound Productions, Inc., produced numerous concerts and recordings, including the “Musical Tributes” and “The Key Players” series at Merkin Hall in New York. Williams’ compositions such as “Arioso,” “Black Scholars” and “Alter Ego” embody memorable melodies and snappy rhythmic construction. Second Floor Music publishes a folio of his solo piano arrangements for 13 of his original pieces. His tunes appear on albums of Art Farmer, Kenny Barron, Victor Lewis, Gary Burton and Roy Hargrove. As Director of William Paterson’s Jazz Studies program, he brought to the campus such jazz legends as Dr. Billy Taylor, Clark Terry, Freddie Hubbard and Pat Metheny, and was active in the establishment of the Thad Jones and Clark Terry Archives. On the Jazz Room Series, he served as interviewer and host on the Series’ acclaimed “Sittin’ In” meet-the-artist interviews, and appeared as a featured performer and sideman to a number of artists including vocalist Karyn Allison, Clark Terry, and as a member of the Vanguard Jazz Orchestra at the Thad Jones Archive dedication ceremony. In addition to his teaching at Berklee, he was a faculty member of the Stanford Jazz Workshop and the National Combo Camp, and the Hartt School of Music, was a regular contributor to the International Association of Jazz Educators, and was artist-in-residence at Harvard University, New England Conservatory, Dartmouth College, Eastern Illinois University, and Cornish College. He presented workshops at numerous colleges and Universities, including Howard University, Shelby State Community College, McGill University, the Royal Academy of Music (London), University of Wisconsin, University of Cincinnati and Drew University. He was a charter member of the Smithsonian Jazz Masterworks Orchestra under the direction of Dr. David Baker and Gunther Schuller.